Recently an in-store customer asked me about Eli Whitney's cotton gin (short for 'engine') and its importance in the first English Industrial Revolution. She was thinking it was the gin that fueled the growth of the English textile industry. Yes....the gin had a dramatic effect on both the expansion of Southern raw cotton production, and thus the institution of slavery, and textile mills in America and Great Britain. In 1793 Whitney's gin mechanically cleaned the seeds from raw cotton. Before his invention, a man could clean about 1#/day. The gin did 12 #s / hour! Grow more cotton! The task of cleaning cotton seeds by hand was just one of the bottlenecks along the road to the Industrial Revolution. John Kay's invention of the flying shuttle in 1733 allowed hand weavers to move beyond the width they could 'throw a shuttle' to 'broadcloth' ( 63" or less). There was an immediate demand for more thread and yarn. James Hargreaves designed a spinning jenny in 1764 which allowed one worker to manage 8 spindles at once. Now the bottleneck was supplying cotton to the spinners. It was almost 30 years before the cotton gin cleared this bottleneck. As I was checking my dates for the 3 'milestones' in the Bottlenecks blog posting yesterday, I noticed there was a span of about 30 years between the flying shuttle, the spinning jenny, and the cotton gin. Technology moves so fast now...my snappy new smart phone was outdated 6 months later by a new snappier version! Did they need to build new wider looms (with more heddles) to take advantage of the flying shuttle? and thus the demand for more spinning capacity was not felt for a number of years? 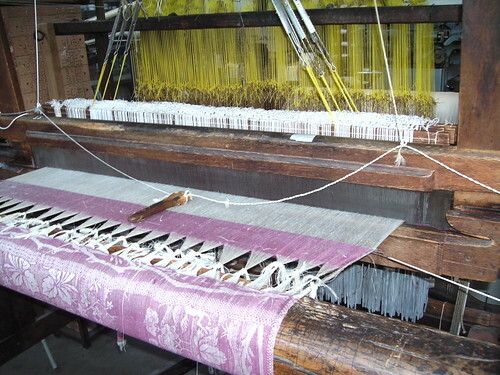 The development in 1769 (5 years after the spinning jenny) of the water frame ( a water powered spinning machine with 128 spindles per machine) dramatically increased British textile production...thus the need for more cotton. Eli Whitney's invention was 24 years later.